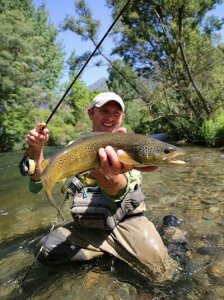 Give the special gift of fly fishing in Asheville’s most beautiful mountains! Gift certificates from Southern Appalachian Anglers are the perfect gift for a variety special occasions, including holidays, birthdays, father’s day, mother’s day, Christmas, employer appreciation, weddings, anniversaries, bachelor parties, & many more! Gift certificates can range anywhere from $25.00 and up to the full price of the guided fly fishing tour. Gift certificates do not have to be trip, species, or location specific (although they can be). With a few simple clicks you can receive your customized gift certificate in minutes! Simply click the link below and fill out your information to customize your gift certificate to instantly receive your gift! Gift certificates expire one year after the purchase date. No Exceptions. Please use gift certificates while still valid. Southern Appalachian Anglers LLC holds the right to deny any recepient services for any expired gift certificate purchased from Southern Appalachian Anglers. Gift certificates can not be returned or refunded. If a scheduled trip exceeds the amount of the recipient’s gift certificate the difference must be paid by credit card or other accepted payment.